The IDHA Fall Event was held on Sept. 28th in Ankeny at the FFA Enrichment Center on the DMACC campus. It was a great success. Over 100 registered dental hygienists were in attendance. 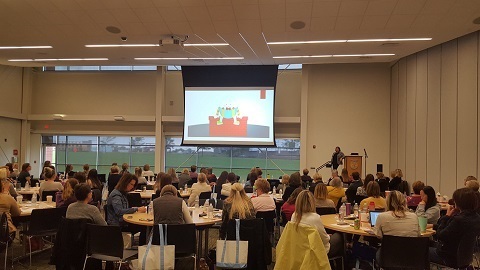 We heard from Patti DiGangi in the morning on Gingivitis and a new coding system, and in the afternoon we heard from Cindy Purdy on Ergonomics. There was a raffle and 2 lucky winners won Crown seating saddle stools. Our winners were Teresa Byers and Kathy Welsch. See you all at IDHA's Fall Event 2019 on Oct. 4, 2019 in Ankeny at the FFA Enrichment Center!